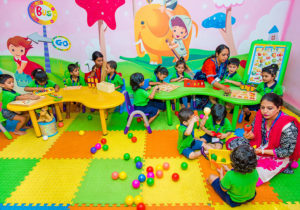 In pursuit of the goal of making our environment conducive for learning,we have sophisticated infrastructural facilities that conform to the requirements for preschools operating American preschool curriculum . They are designed to equally accommodate our bloated curriculum as well as meeting the basic needs and interests of the preschoolars. Our schools are very neat, catchy and very attractive. Our classrooms are array of beauty both at the interior and exterior. The interiors are colourful and the walls have pictures and posters that remind the kids what they are to learn on daily basis. The furniture are of international standards and are arranged to give room for the teacher to have assess to each child. We made provisions for both white and soft boards for interactive learning. For WOW Kids, each activity time is a memorable one. Our Activity Area is spacious and made safe to accommodate our kids without them running into one another. Our curriculum is integrated into our activity time such that our kids are made to learn basic concepts in a play-way method. Prescholars easily grasp concepts for Role playing activities in Doll House, Farm House, Pet House, Jungle, Concept Hut, Departmental Store, Puppet Corner, etc. 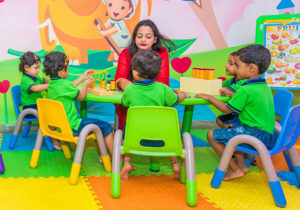 They are also exposed to creative activities such as Reading, Painting, Story Telling, Dressing Up, Scribbling, Jumbles, Jigsaws, Building Blocks, Finger Painting, Clay Modelling, Paper Tearing, Folding and Pasting , puppets making etc. They participate in buying and selling activities in the Tuck shops to inculcate in them the basic concepts of numbers and mathematics. Our Audio Visual Rooms are amazing. They are well equipped with world-class technological facilities which act as catalyst to boost teaching and learning. They are equipped with Large Format LCD or Plasma Screen/ Projector, Audio/ Video Player and Computers which makes learning practical, captivating, interesting and effective. We take learning away from abstract to concrete and practical demonstrations using teaching resources like animation clips, videos, pictures, rhymes; stories, etc. These are displayed to the children with the use of projector on a big screen. We created a multimedia corner with touch screen computer that enhances the learning of concepts like shapes, colours, blocks etc. At Wowkids schools, our kids are celebrated. We have a mini auditorium equipped with small stage and audio/ video equipment where children celebrate their birthdays together on monthly basis .The auditorium has facilities to prepare the children for stage exposures. Other social events and various festivals which are also attended by parents are celebrated in our auditorium. This gives room for parents to interact with the teachers and see themselves as part of the WOW KIDS family. 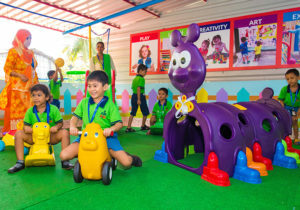 Wowkids play area is constructed and prepared as a safe ground for children to acquire psychomotor skills. It is equipped with swings, slides, bouncy, mini train, merry-go-round, splash pool, tunnels, trampoline and many other play equipment. Children are exposed to activities that develop and make them grow physically, mentally and emotionally. It creates forum for them to associate and accommodate one another. We create fantasies by organizing magic shows, bear shows, monkey shows, puppet shows, sledge riding, etc.